PDI provides our customers next day on-time delivery tailored to their needs. We strive to be the best in the business! What makes PDI stand out? The employees of PDI make up its unique dynamic culture! We have a family atmosphere the makes it enjoyable and fun to come to work every day! Why should you choose to drive for PDI? PDI is a leader in the transportation industry. The respect and loyalty we show our drivers is above and beyond other companies. What is so unique about our warehouse? PDI is a 24/7 operation offering competitive wages, incentive pay, quarterly bonus, and flexible schedules. 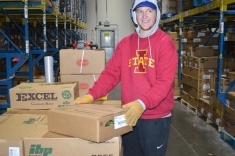 PDI, a Hy-Vee company, distributes perishable products to Hy-Vee Stores in 8 Midwestern States. Visit our Career Opportunities Page to apply online today! PDI, a Hy-Vee company, thrives on working as a team to achieve a high level of customer service. We offer flexibility and a family environment where every employee is valued and respected. We care enough to provide training and tools to be successful. As a company, we set challenging goals to be successful and provide the best distribution in the business! "Our mission is to enhance the success of our customers and employees by providing the best combination of price and service with the highest level of honesty and integrity."